Our little one has arrived! Stats: 7 lbs 8 oz, 19 1/2 inches long. Looks like his daddy! We had been planning for and praying for an all-natural birth with no medications for me or the baby, and it was even better than I dared to hope it would be! I feel SO blessed. We took a 12-week course called Bradley Method that teaches you how to cope with pain and why unmedicated birth is a great way to go, then toward the end of the pregnancy we followed a five-week home study course called Hypnobabies that teaches you how to relax throughout labor. We joked that he could come any time starting the next day, and that if we went into labor on Valentines Day, we’d just name him Murphy for Murphy’s Law. After dinner, about 8:30 p.m.: We head down to the hotel’s heated pool and enjoy hanging out together. My feelings of general crampiness start to turn into discernible contractions with a beginning and an end, and somehow they START at 6 minutes apart! But while the contractions were increasing in intensity, they still felt completely manageable – not bad at all! In case this was false labor, we decide to head up to our room, drink some water and take a shower to see if the contractions would go away. 9:30 p.m.: I lay down in the hotel room and watch the Olympics while we time a few contractions. Five minutes apart, but still not so bad! We decide we’d better start the hour drive home so we can pack our things, labor at home and have time to drive the hour to the hospital. Andy goes down to the front desk to see if we can get our stay refunded. They say no, until he tells them his wife is in labor! We walk through the lobby to our car between contractions, and Andy says to me, “You have to act like you’re in more pain than this! They won’t believe we’re leaving because you’re in labor!” So I hobble convincingly. 10:30 p.m.: We arrive at home and I lay down in bed and start relaxing through each contraction, breathing silently and listening to our Hypnobabies relaxation CDs. Meanwhile, Andy goes into high gear getting us ready for the hospital stay. He does a great job keeping me hydrated and comfortable. 11:00: Contractions are intensifying, at about 4 minutes apart now, and I throw up after almost every one. Poor Andy – he cleaned up after me, helped me wash up and not feel so gross! What a great labor coach. At this point the Hypnobabies stopped working for me, because I’d be so relaxed – almost asleep – that the peak of each contraction caught me by surprise and I wasn’t able to prepare myself, so it was more painful. We switch to Bradley technique, with Andy applying counterpressure, and me moving around a lot to find the most comfortable position. I should say that one of the silly things I was most nervous about was the moaning and weird animal noises that women make during labor. Thankfully (I don’t know why this bothered me!) I was silent the whole time, just breathing through each contraction and trying not to fight it, but just to go with the whole feeling. 1:00 a.m.: Contractions increase to 3-4 minutes apart, and Andy says it’s time to go to the hospital. I feel like it should hurt more than it does, and I’m nervous that we’ll get to the hospital and they’ll turn us away because we’re only a couple centimeters, then make fun of us for being silly first-time parents! So I stall. 2:30 a.m.: We leave for the hospital. Andy has everything perfectly packed, even a place for me to throw up. I DO NOT WANT to throw up in the car. I spend the hour drive to the hospital sleeping between contractions or moving around in the back seat to get comfortable. At one point I wake up and see that Andy’s stopped at a stop light at the intersection of two empty streets. “You can run lights like this!,” I tell him. He speeds, and a cop car follows him for a while but he doesn’t slow down. 3:30 a.m. We arrive at the hospital, I step out of the car and collapse on the cement, throwing up. Andy was worried about me, but I was actually just thrilled that I made it the whole way and didn’t have to throw up in the car! At the emergency room, they offer me a wheelchair but I prefer to walk – quickly! I walk through a contraction, and because I didn’t have to double over in pain, I’m pretty sure I’m probably not dilated enough to be here yet. We get to labor and delivery, and judging by the way we’re acting, the nurses don’t think I’m in labor. They ask me my pain level on a scale of 1 – 10, and I say 7 or 8. I remember that my midwife said most women in real labor say they’re at a 40! The nurse checks me and I am NINE CENTIMETERS! “Did she say 9 cm? !,” I say. “Did you say NINE? !” I’m SO excited. They start the water for the birthing tub. 4 a.m.: I get in the water and feel almost instant relief! It’s time to push this baby out, and I didn’t even recognize a “transition,” which is supposed to be the least comfortable point of labor. I remember a lot of moms saying pushing was the easiest time for them, but it was my least favorite part. I was SO tired that I just didn’t have the energy. The pushing phase lasts for YEARS. Andy sits on the outside of the tub, supporting me and keeping cool washcloths on my face. At one point, he asks me if he can leave to go pee, and I tell him NO. (I don’t remember this!) He suffers with me. 5:56 a.m.: FINALLY, the baby makes his appearance! I pull him up to my chest and out of the water. He’s beautiful. Andy and I just say “Ohmigosh ohmigosh ohmigosh” over and over. 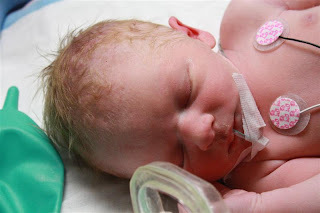 Unfortunately, the little guy had some trouble breathing – he has a pocket of air outside his lung that makes it impossible for his lung to fully inflate, so he’s in NICU for a little while, but he’s improving all the time and will be just fine. We’re praying for him, but I feel at peace. I’m sure he’s going to be okay. The hardest part is that we haven’t been able to hold him! When we can hold him and chat with him, we’ll be able to ask him what he thinks his name should be. PS: You can read my baby girl’s birth story here. I'm so impressed with you and Andy!! Way to go! Isn't it so fun to fall in love with your husband in a new way?! And that's what Chandler had, a pneaumathorax. I AM PRAYING!! By a miracle, Chandler's cleared within 24 hours, and I'm praying that Murphy (? )'s will too!! So you can start nursing, and hold him, and all that fun stuff. LOVE YOU!! here's the full story if you want to see it, given his similar condition. what a great story guys! I think this really speaks for natural labor progressing so much faster than induction. When I was told I had to be induced, I knew I was in for it! So glad he is here and I pray he will be with you guys ASAP. And, I totally agree, pushing lasts YEARS and I didn't even finish the drill with mine! He's adorable and it is the best journey ever…ENJOY! Oh! And it is so bizarre how open some men are to talking about baby stuff. I had two guys in one week recommend buying an electric breast pump verses a manual one… I'm thinking, "Are we really having this conversation?!" Just stopping by from Thrifty Decor Chick and started reading some of your archives! Great birth story. I am due March 16th and am planning on using the Hypnobabies birthing method. It is wonderful to read of others experiences with the program. My baby girl, born last July, was just like this. I laid in bed from 1-4 AM thinking about how annoying and mild my contractions were, and that I couldn't sleep – and finally told my husband we should make our hour long trip to the hospital. I was 6 cm when we arrived at 6:20 AM and she was born at just after 7 AM. It totally freaked my husband out that we could have had her in the car. He had no idea I was laboring so badly because it didn't hurt much until the last 30 minutes. I would do it again any day! Omgoodnes I have to give you props for doing this naturally. We want to start having kids this year and I am freaking out! Thank you sooo much for sharing this! You guys prepared yourself so well and it really paid off. I’m not as brave as you, but I’m going to try to go as long as I can without any meds. If we all come out safe and healthy then I will be one happy mama! Aww yay! Congrats!! As long as you have a happy baby and you’re feeling well, that’s what really matters!